Following on from Phil's last post, here is my one from Bexhill. On Saturday, Wonky Horizons went for quite a tour of Sussex and Kent. We stopped at Bexhill during the afternoon for a most welcome coffee in the De la Warr Pavilion. 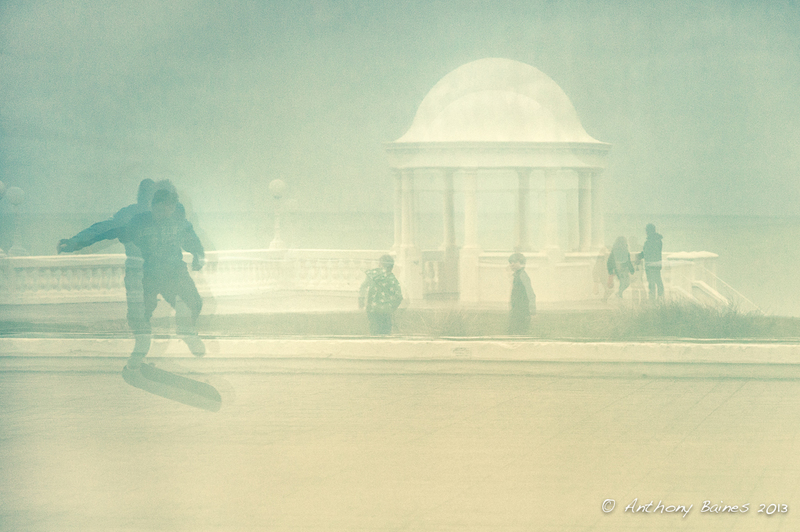 It was Phil who noticed the reflections of skateboarders in the windows of the pavilion that face the sea. Never being one to miss an opportunity spotted by somebody else :-), I had to join in, as did Martin. Here is my version. It was one of those miserable afternoons weather-wise: grey skies and a biting damp wind. It felt desperately cold. Even though the icy day did not put off the skateboarders (who were out in force), I don't think there will be very many brass monkeys born in Bexhill next year. While we were in the Pavilion itself, we took a brief look at BMX Channel, the film section of Cycles of Radical Will. This is part of an exhibition by Shaun Gladwell, and shows a wall-sized video of a BMX biker using his bike to dance. The film is in slow motion, and the movements are amazingly graceful; combining this with the flight of gulls around the lone BMXer and the movement of the waves, it's really quite hypnotic. If you're passing Bexhill, I can highly recommend it. In fact it's a good enough exhibition that it did not provoke Phil to any more of his art rage.